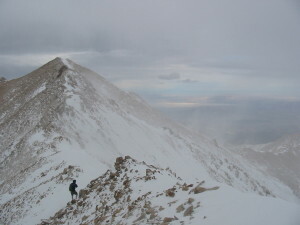 The author bucks the wind near a summit at 13,000 ft. But was this the spot with the highest wind velocity that day? Surprisingly, no. The search for the highest wind speeds usually leads us to the tops of mountains and ridges. Higher topography should result in greater air velocity, right? Intuitively, we expect windiness to increase with height and elevation. Tall buildings, towers, poles, hills, and mountains certainly seem to be the places to experience high winds. It turns out that while localized prominence above surrounding terrain certainly does make a big difference, higher points on a mountain do not necessarily translate directly to more wind or even the highest velocities. Air velocity changes as the result of a pressure gradient from high to low. In absence of obstructions, air will move from sources of high atmospheric pressure to convergence points with low pressure, subject to the Coriolis effect. These pressure differences can be regional in scale, such as one often sees on weather maps, but also very localized, as in the case of convective activity due to solar heating. Once obstructions or topographic features are introduced, air movement becomes complicated. Behaving in a similar manner to a fluid, air wants to find the easiest path around or over a particular surface. Dust can be a great indicator of airflow conditions. 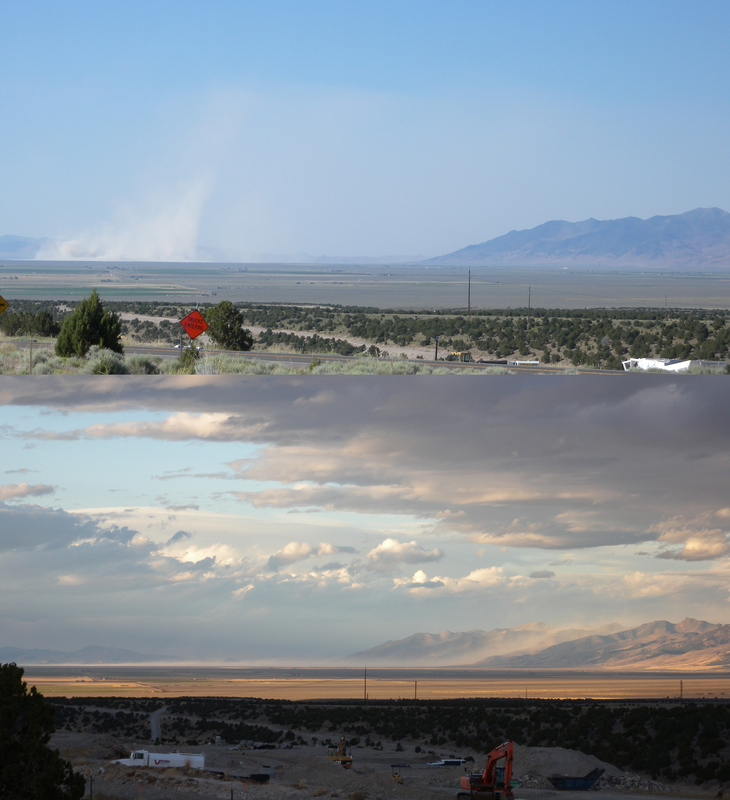 In the top image, dust from a playa in central Nevada is carried aloft with strong convective heating. 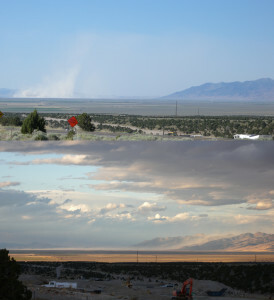 Below (on a different day), the same dust is carried at ground level up and over the nearby mountain range as lateral airflow associated with frontal passage dominates. Various levels in the atmosphere contain bands of moving air driven by global processes, such as jet streams or divergence zones. Given that for our purposes here we are sticking with relative air velocity as modified by regional to local terrain obstructions, we will leave these larger-scale patterns aside, although the position and altitude of jet streams can very much affect the tallest peaks. Very rough surfaces (such as urban environments with their mix of buildings, roads, and trees) create tremendous opportunity for turbulence and eddies in air currents, slowing air down at this interface. The majority of air will try to find the smoothest path and will bend and move like a river channel in order to get there. These areas of free flow just outside of the turbulence zones are where air is likely to be found traveling at the higher velocities. Thus, it can be expected that locations with the least amount of roughness but with some proximity to obstructions are more likely to be windy spots. Of course, the height above the terrain at which wind is measured is going to be very important when examining wind data. However, for purposes of “windiness” as perceived by humans or local vegetation, we will stick with a measurement height of 10 meters or less (typical for a meteorological station). When examining a series of these measurements along a gradient from the valley to the mountain top, we can find some interesting results. How do maximum wind speeds vary with elevation? 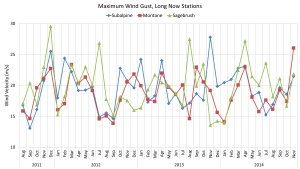 One example of wind speeds varying across the gradient in mountainous is illustrated with 3 years of data from 10-meter weather towers in the central Great Basin. The chart below shows that, surprisingly, the lowest elevation station of the three clocks the highest monthly wind speeds quite frequently. This low station is situated in a sagebrush ecosystem with scattered nearby juniper trees, providing the least-rough ground surface and terrain. The stations at upper elevations are located in semi-prominent spots with surrounding woodland, certainly not directly on ridges or peaks. 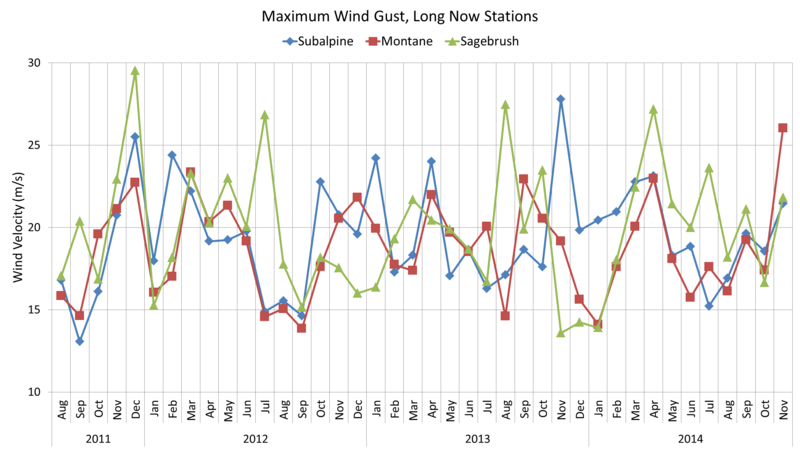 Over three years of monthly maximum wind speeds are shown here from three stations in the Snake Range, Nevada. The Sagebrush station is the lowest elevation at 6000 ft, the Montane is mid-elevation at 9000 ft, and the Subalpine station is the highest at 11,000 ft.
On a particularly windy day, the author was up on the north end of California’s White Mountains. 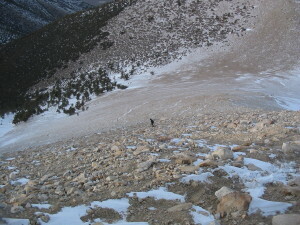 A high saddle feature above treeline at the very north end of this tall range possessed much higher near-surface wind velocity than the two summits and intermediate ridges just to the south. Depending on regional topography and also on prevailing large-scale pressure conditions, the elevation with the greatest wind velocities is going to be different (and this is partially reflected on the chart). 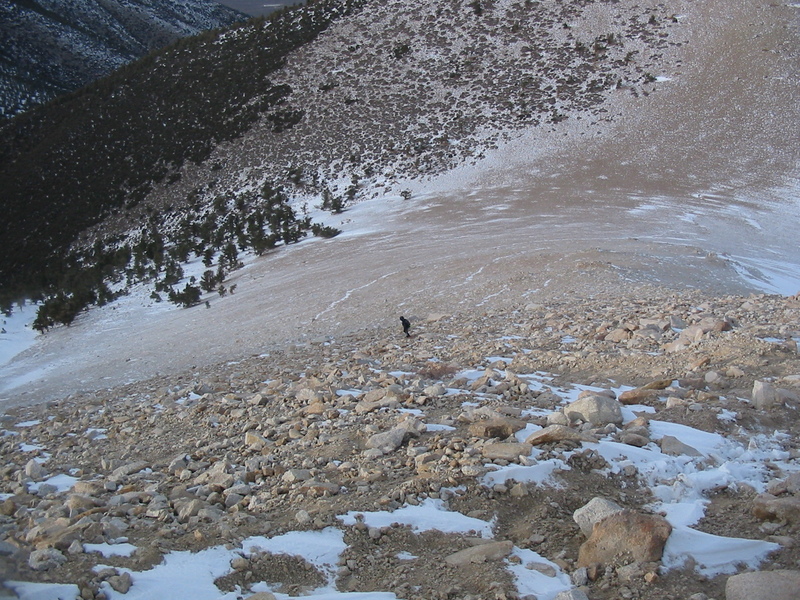 In general, it turns out that the highest wind speeds near the ground surface are usually present in high saddle topographic features, where the air is allowed to bend around a prominent peak. The author has climbed many summits between 10,000 and 18,000 feet in high wind conditions, and has noticed the most extreme velocities in these saddle regions. We still have a lot to learn about distribution of wind speed across complex terrain, but as more and more mountain systems are instrumented, we can expect to see our knowledge in this area of mountain meteorology increase accordingly. Do you share the same opinion, or have an alternative view? Post a comment below or Tweet it!